Glyph templates offers 3 different menus to choose from. Each of them can find a useful purpose in your next blog, news or magazine project and it will make you stand out from the crowd. This menu type is the most standard menu that you see everywhere on the web. It is positioned in the header it has all menu items displayed next to one another. This is always a safe choice. This menu is positioned on the left side of your website and it offers a cool feature of presenting some of your posts right bellow the menu items. You can use this area to display your latest news, magazine or blog posts to make sure that the visitor will always see them. 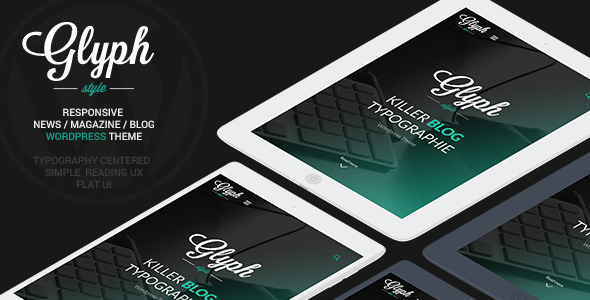 Blog post archives in Glyph are the main advantage of this news, blog and magazine theme. You have a choice of 3 different archive versions depending on the type of your blog. Although it is named standard blog post grid it is far from it. We have taken standard to a new level with this version of the grid. Blog posts are displayed in a form of “1/1 full width post” followed by “1/2 posts” and it rotates in that way. Dynamic post archive has a primary function to make all your content on a page fun to read and scroll through. With the clear focus on the title, excerpt and image, this grid would be the prefect choice for almost any type of blog, news or magazine website.